In the previous post, Part 1, we developed the start of a framework. The purpose of the framework is to allow us keep a clear picture of where all our project are at. In today’s post, we will develop this further. Taking projects from the selection stage on through planning. And the into the whirlwind of execution. All the time, maintaining an element of control. Yesterday we left off with ensuring we had our project sponsor onboard. Our project champion so to speak. The next stage in the project is to develop detailed plans. This starts with a Work Break Down structure. We refer to this as a WBS. 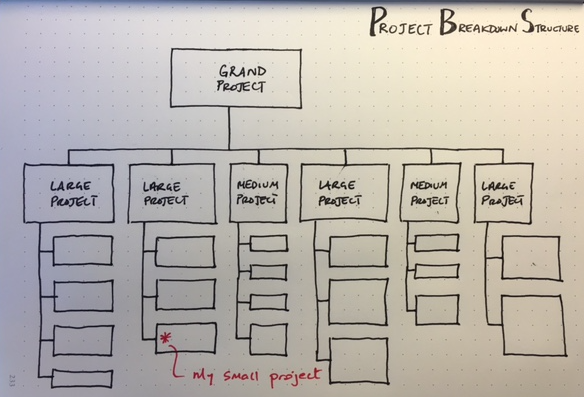 I prefer to call it a Project Breakdown Structure. The project breakdown is a critical part of the project. It is where you decide how you will break the project down. Into smaller and smaller elements. These are inter related mini projects. And may assign these to other teams members, Or even outsource them to external partners. This topic deserves a series of post. Below is a simple sketch which outlines the idea. As always, I update my dasboard. It now looks like this. Note: There is a status for the the WBS as well as a link to it’s location. Now I have a WBS (and WBS dictionary). Yes, I will write more on this topic later. The next stage is to develop an estimate for the project. The estimate is developed using the WBS. Once I have the estimate built up, I develop my schedule. For large projects, I would involve some of the team in developing the WBS, estimate and schedule. For smaller projects, I often do it myself. Then I get someone to review it. And then? I update my dasboard. It now looks like this. And yes, I do not have any estimates or schedules yet. Now that I have laid out a good plan, I am ready to start delivering. For this game, I like to design a scoreboard. People play differently when you keep the score. Finding lead measures is the first step. Lead measures are predictive of an outcome. They can be influenced or driven by the team. Setting up my scoreboard is execution activity number one! The topics of scoreboard is one that we will come back to in another post. Click on the image to see a larger version. I will be sharing this template soon. The plans become maps. The maps guide me and I mark then up as I progress. They tell me at all times where I am. The dashboard is updated with links to these documents. And now I have my dashboard. Live for all projects. Updated daily. Or perhaps weekly. Every aspect of every projects can is available to me from here. That is it. Hope it was useful.